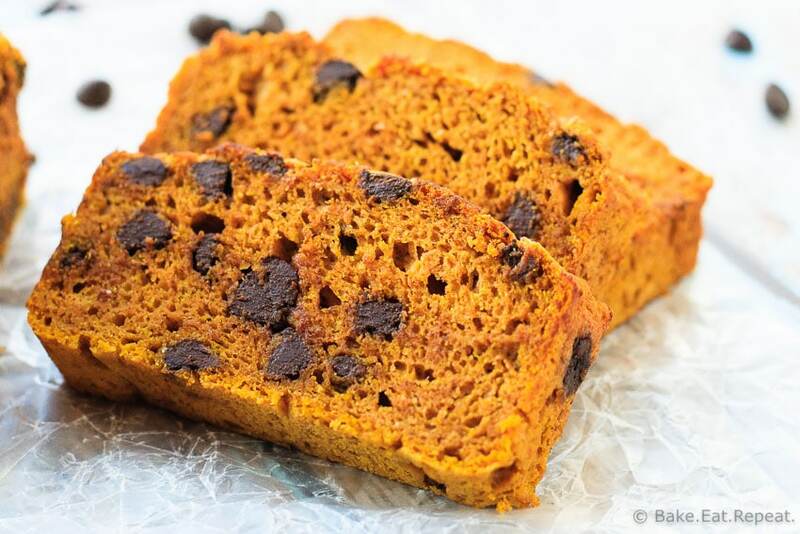 Easy, moist, delicious, and healthy, this chocolate chip pumpkin bread is perfect for a snack, or even for breakfast! Low fat, low sugar, and whole grain. Well. This is not what I was making for you. It was supposed to be cheesecake pumpkin muffins, a variation of these carrot ones in fact. And they were good, very good. We ate them all with no problem whatsoever. The problem was the cheesecake. It kind of looked like cheesecake icing on top of the muffins – just a thin layer of cheesecake covering the tops. Not a bad thing I suppose, it just kind of looked weird. And I didn’t want to give you weird looking, because who’s going to want to make that? So then I decided I would make cheesecake filled pumpkin muffins instead. Because then you get the tasty cheesecake and pumpkin combo without the weird looking cheesecake topping. I still think this is a great plan and will do it eventually, but this is not it, because I ran out of cream cheese and didn’t want to go back to the store. So then it was a toss up – bread, muffins, topping, no topping – too many options! So I decided that the world could always use another plain old pumpkin bread recipe. There can never be too many of them in my opinion. With chocolate chips. Because chocolate. I think this was the right decision. 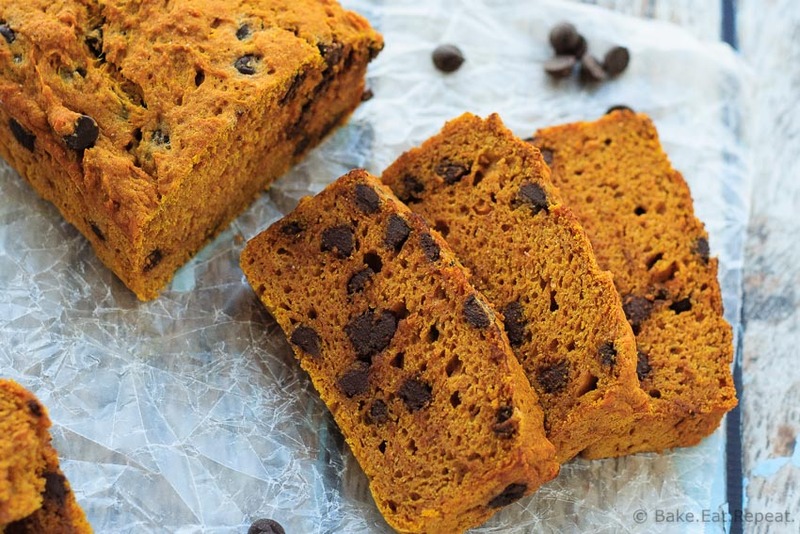 Chocolate chip pumpkin bread. It doesn’t get much better than that. 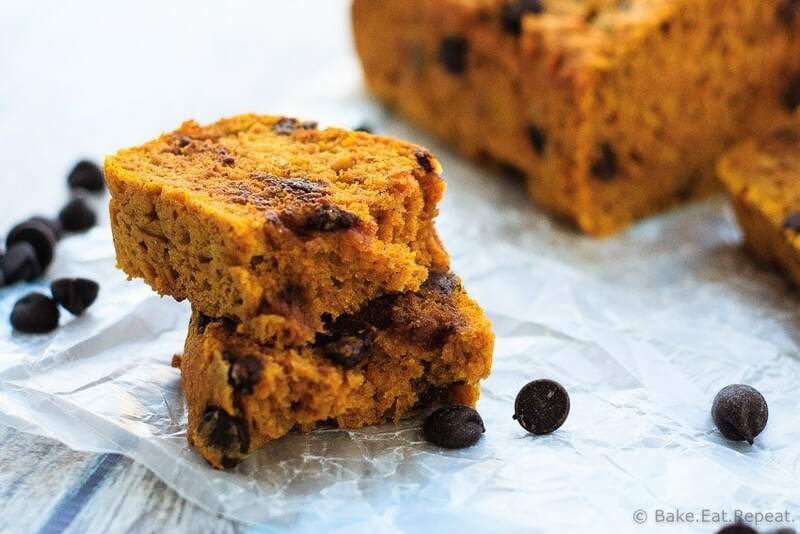 Plus, it’s pretty healthy pumpkin bread that you can eat for breakfast guilt free. Low fat, low sugar, with whole wheat flour – and you can even omit the chocolate chips if you want to get all crazy or something. I wouldn’t though. Because, um, chocolate. Chocolate is always the right decision. Also – it’s healthy pumpkin bread that tastes decidedly unhealthy. In other words, it’s amazing and you should make it. If you’re not pumpkin-ed out yet that is! I haven’t made this loaf in a 9x5 inch pan, but if that’s what you have, I think it would work just fine. The two 8x4 inch loaves are quite small and the bread does not rise much in the oven, so it should work well as a larger 9x5 inch loaf. Just watch your bake time if you make the larger size as one larger loaf would take longer to cook, expect another 10-15 minutes on your baking time. Ooo...this looks delicious! Do you think it would work well for mini loaves? I've never tried, but I don't see why not! You'll have to reduce the bake time though, probably to about 30-35 minutes rather than 60-70? Just keep an eye on them and test with a toothpick to make sure they're done, but I'm sure it'd be great as mini loaves too. Let me know if you try it! Sometimes I have recipes that don't work, no matter what I do. This bread looks perfect Stacey! Great combination, need to make it for the holidays! Cheesecake filled pumpkin muffins ARE an awesome idea, but this bread looks just as incredible! SO moist! Sometimes the recipes don't work out no matter how many tries we give them. The important part is getting back up again and making something fabulous. And you did that, Stacey! Cheesecake filled pumpkin muffins sound pretty delicious and I do hope you eventually share them! But until then I am completely OK with devouring slice after slice of this delicious pumpkin bread filled with chocolate chips! This is a fantastic way to devour pumpkin and carbs! SO YUM! Cheers and thanks for sharing the YUM! Yeah, I definitely still need to make those! But chocolate chip pumpkin bread was a pretty good replacement! :) Thanks Cheyanne! Chocolate chip and pumpkin is always a winner in my book! I'm seriously craving a slice of this gorgeous bread right now, Stacey! Love love how soft and moist it looks! Chocolate and pumpkin IS always a winner, I love that combo! Thanks Sarah! I think this was a good decision! 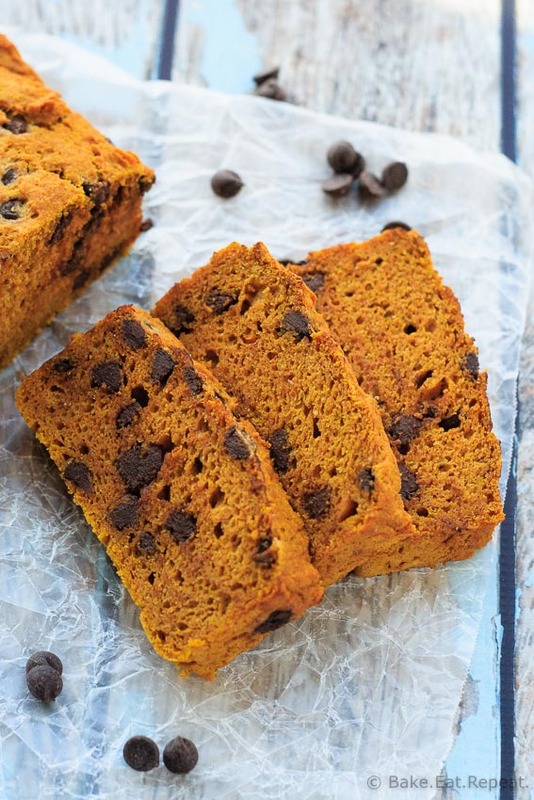 Chocolate chip pumpkin bread sounds amazing! And perfect for the season. :) The cream cheese version sounds good, too! Can't wait to see that one! Yeah, I definitely still need to make that version, I think it'd be fantastic! Thanks Jess!